The percentage of Facebook budgets allocated toward social ads rose to 23% -- up from 5% in the past 12 months, according to data released Monday -- but a look at the change in corporate firewall policies could influence a shift in budget allocations to mobile by the end of this year. 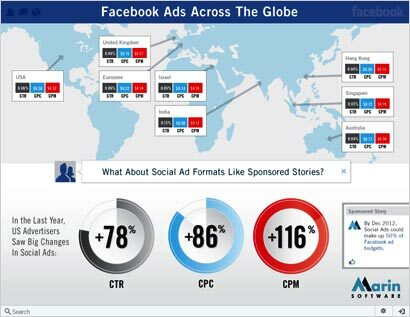 Marin Software predicts that by the end of this year social ads, or Marketplace Ads supported by Sponsored Stories, will account for nearly half of brands' Facebook ad budgets. These ads are traceable through application programming interfaces (APIs). The other half, the demographically targeted ads, do not incorporate the social graph. The company supports Marketplace Ads sold in an auction-like model. Unlike other Marketplace Ads that operate similarly to traditional display ad units, social ads on Facebook include site user endorsements in the ad copy. Consumer engagement with Facebook ads rose in the past year -- about 50% -- as measured by click-through rates (CTR). In the past year, the cost per click (CPC) of social ads increased 86%, while the CPC of Marketplace Ads fell 15%. Consumer engagement with Facebook ads -- as measured by click-through rates -- rose 50% compared with the last 12 months, implying a boost in overall ad relevance. Marin analysts believe Facebook's move to increase ad relevance through a focus on social ads and the introduction of Sponsored Stories is paying off. Yes -- but how will the growing number of corporations blocking access to Facebook behind a firewall during a typical workday change the performance of campaigns and the perception of consumers? That is something Marin's analysis didn't address. Facebook ads continue to take market share, but consumer use continues to decline during week days at an average rate of 2.8% per quarter since Q1 2011, according to the State of the Web study, a security research report published by Zscaler ThreatLabZ, the research arm of Cloud Security Company Zscaler. Enterprise companies continue to enforce policies on social networking, placing more controls on what is accessed online by employees. Policy blocks from users attempting to access social networking sites rose from 2.46% in January 2012 to 3.99% in March. Blocks from users attempting to post or write content to social networking sites increased from 0.01% in January to 0.18% in March, according to the report. Will the block make changes in the dynamics of online marketing by prompting consumers to pick up their mobile phones to access Facebook? Marin VP of Marketing Matt Lawson said Facebook's recent move into the mobile ad space -- allowing social ads, sponsored stories, to serve up in news feeds on mobile devices -- points to the importance of ad units on mobile devices. 2 comments about "Facebook Ads Strike Chord With Consumers". Nick D from ___, May 8, 2012 at 9:33 a.m.
>Consumer engagement with Facebook ads -- as measured by click-through rates -- rose 50% compared with the last 12 months, implying a boost in overall ad relevance. Yes, but the figures are still derisory, despite them not being quoted in the article. A shift from 0.01% to 0.015% may be 50%, but it ain't big! Larry Kim from WordStream, Inc., May 14, 2012 at 6 a.m.
Reading this you might think that facebook CTR's are high. but in absolute terms they are the lowest in the industry (around 0.04%, which is less than half of the average CTR for banner ads). Notice how the CTR statistic is missing from the research. That's quite an omission by whoever developed this infographic.